"Discover The Quick & Easy Way To Make Your Websites Look Even More Professional And Work Even Better, Without Spending One Cent On New Software..."
I was in my local bookstore recently, browsing through the computer section. Want to know what I found? Book after book after book on making websites look great - BUT - not a single one less than 500 pages! I don't know about you, but I don't have the kind of free time to wade through 500+ pages of technical details. Do you? 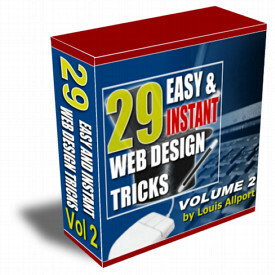 I'm bringing you twenty-nine easy to follow web design tricks and tactics that can effortlessly make your sites look better, work better, and even have a considerable impact on your sales. In this video you'll discover how to create a popup that beats every blocker on the market. Here I'll talk you through a tactic that allows you to easily keep private areas of your website out of the search engines. In this video I'll talk you through how to get all the PHP settings from your web site. Why is this important? Well, if you ever buy or install scripts, knowing this information is very important. Here I'll reveal an incredibly powerful tactic that allows you to redirect website visitors depending on which site they came from. In this video I'll show you how to stop people linking to and stealing your graphics. Here you'll discover how to add password protection to a web page in literally sixty seconds or less. In this video I'll reveal a very easy to use but also very powerful way to password protect areas of your website. Here I'll show you how you can fully customize your "Page Not Found" error messages. In this video I'll talk you through how to understand and start working with Server Side Includes. Here I'll talk you through how to use Server Side Includes to import HTML code into any web pages you choose. In this video you'll discover how to use Server Side Includes and PHP code together. Here I'll talk you through how to use Server Side Includes with any file extension you want. In this video I'll show you how to use Server Side Includes to make changing your website links very quick and easy. Here I'll talk you through how to use the H1 tag together with CSS to help your page in the search engine rankings - and - look great at the same time. In this video I follow on from the last video and talk you through how to use the H2 tag together with CSS to help your page in the search engine rankings even more. Here I'll show you how to create a great looking site map in literally two minutes. In this video you'll discover how to add text input boxes to your pages. Here you'll discover how to limit how much text your website visitors can enter into your text boxes. In this video I'll show you how to set a default value for your input text boxes. Here I'll show you how to create a special type of input text box that's designed for accepting passwords. In this video you'll discover a neat trick that makes your input text boxes look a lot nicer. Here I'll show you a clever trick that makes your website links look far more interesting. In this video you'll discover how to prompt your visitor with a Yes/No question whenever they click a link or button of your choosing. Here I'll show you how to instantly hide the contents of private folders on your website. This is an important security measure. In this video you'll discover how to disable folder listings. This is a somewhat advanced but very useful tactic. Here you'll discover a little-known but very powerful way to set up instant redirects on your website. In this video you'll discover how to easily add menus and sub-menus to your web pages.